At the Centeno Schultz Clinic we have previously discussed treatment of anterior cruciate ligament (ACL) dysfunction. Anterior cruciate tears have been successfully treated with stem cell therapy. Below is another successful case of ACL repair utilizing stem cell therapy. BT is an 18 y/o college football player who sustained an acute anterior ligament tear. He declined surgical repair and underwent Regenexx SD with placement of his own stem cells into the ACL in November 2012. Three months post injection a repeat MRI was performed at the same imaging center. 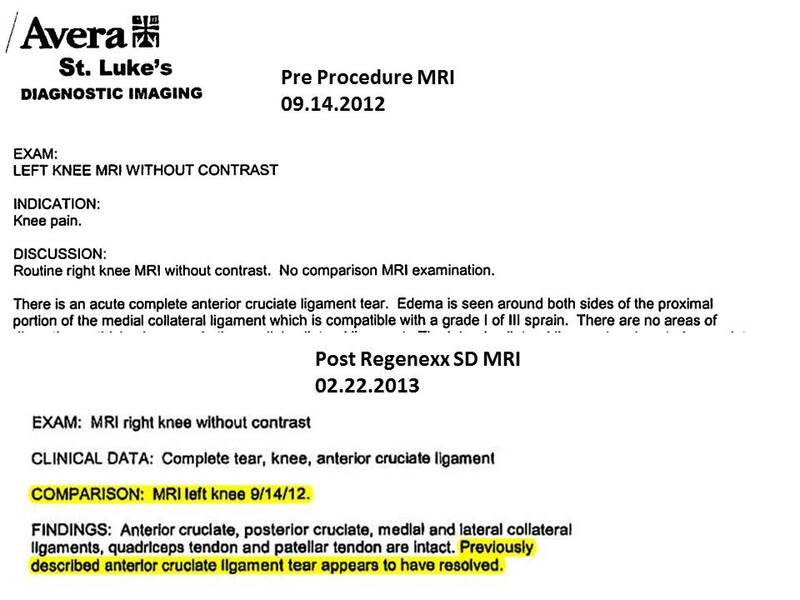 Below are the pre and post images of the ACL along with the MRI reports. 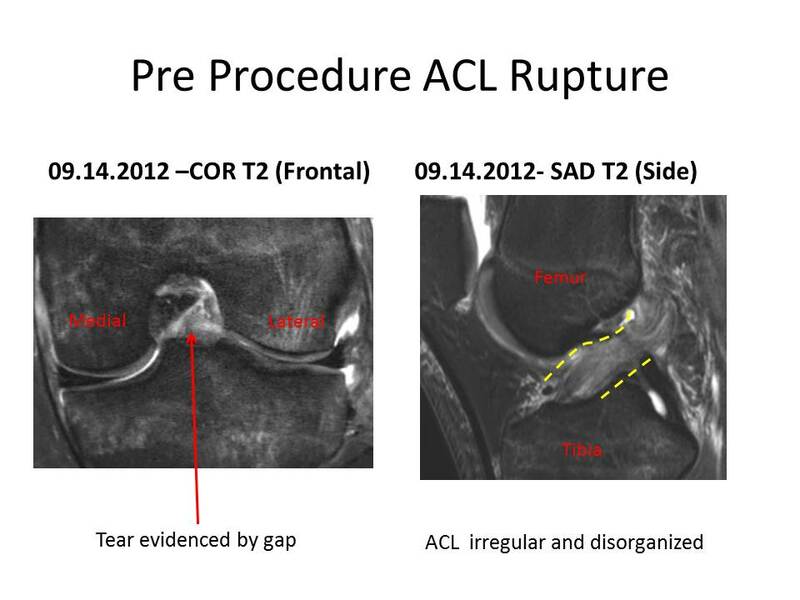 The ACL in the pre-procedure MRI is irregular and disorganized with a visible tear. After Regenexx treatment the ACL fibers are uniform and well-organized. 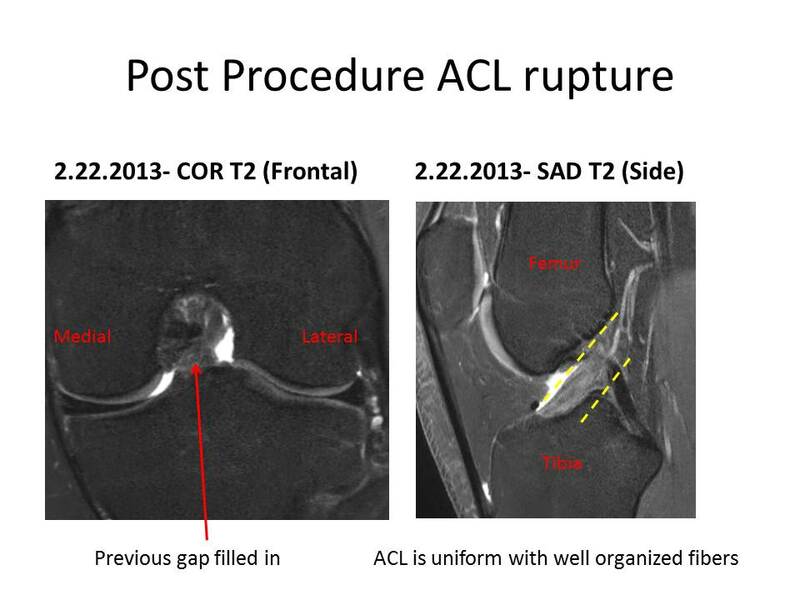 The postprocedure MRI formal report notes “previously described anterior cruciate ligament tear appears to have resolved”. This corresponds to BT’s clinical presentation who describes no pain or swelling. Regenexx SD enabled BT to avoid a major surgery and extensive rehabilitation. A new option is now available for ACL dysfunction.